These Spanish beans with tomatoes and smokey sweet spices are so easy to make in less than 20 minutes. They’re perfect as tapas, main meals or a side dish. Vegan and gluten-free. 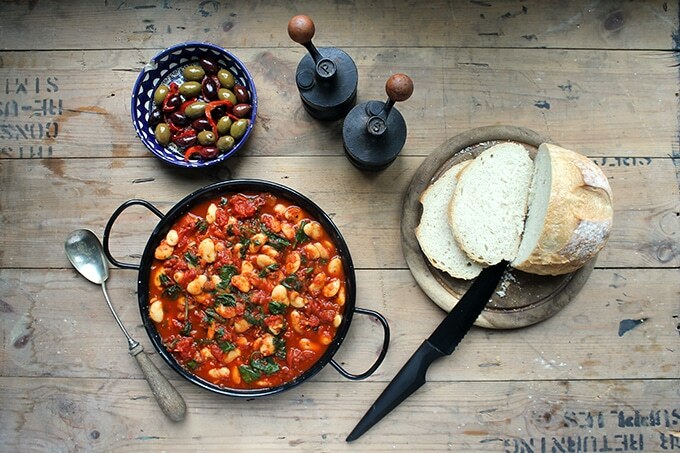 This easy gluten free vegan recipe for Spanish beans is rich, flavourful and smoky. 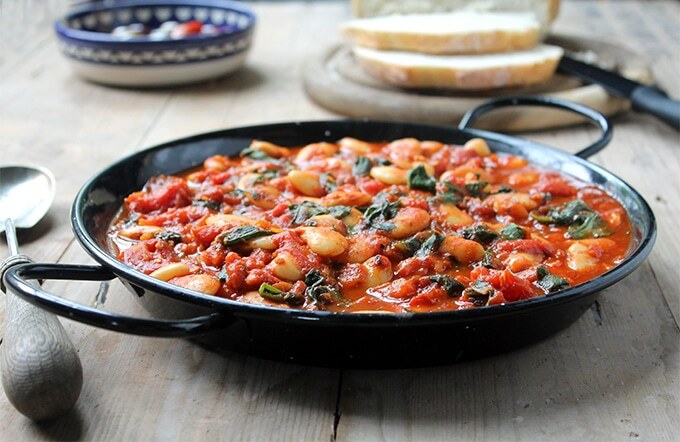 The white beans stew in the thick tomato sauce, spiced with paprika. It is perfect mopped up with a slab of crusty bread. 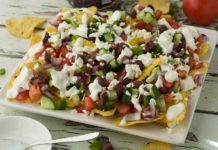 You can serve it as tapas, on it’s own or as a side dish. Plus, it’s ready in 20 minutes! I used canned white beans (butter/lima beans) but you can also used dried beans. Just soak them for 4 hours or overnight in a bowl with plenty of cold water. Then drain and rinse them before boiling for 45 minutes. Then carry on with the recipe. You can substitute any other white beans that you have to hand, though I like the large butter beans, lima beans. They have a great potato-like texture that really makes this a hearty dish. My husband recently returned from a trip to Almeria in Andalusia, southeastern Spain. He was raving about the beans in tomato sauce that he had and said that they were an amazing vegan option. I’ve tried to recreate them here, but this is definitely an adaptable dish. If you like things spicy, then go for a hotter paprika, if you like them sweeter then use a sweet/smoky paprika. You could even add a tiny pinch of cinnamon for another falvour dimension. 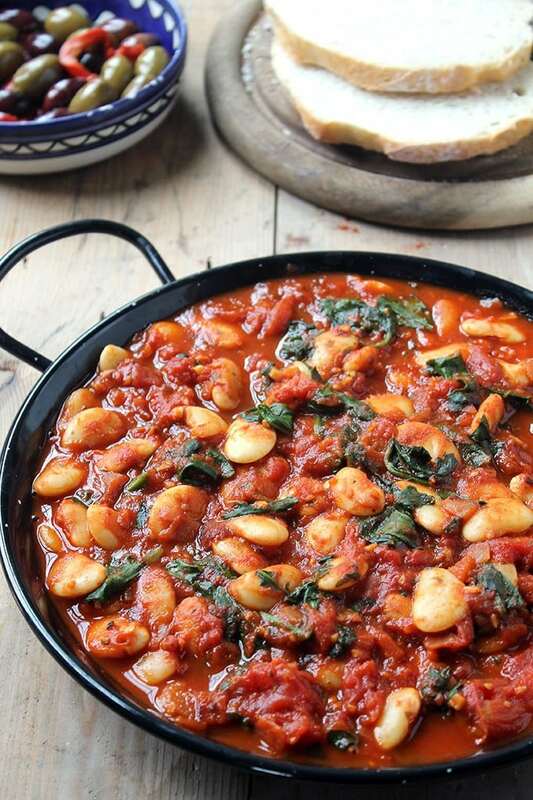 You can serve these Spanish beans as tapas alongside olives, bread and patatas bravas, perhaps with a few Spanish beers or a big jug of sangria. 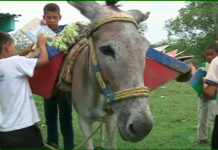 I tend to have it simply served with fresh crusty bread to mop up those fragrant juices. You can also serve it as Spanish Beans and Rice, by serving it on a bed of… rice. If you’re looking for other gluten free vegan main meals, try my vegan shepherds pie or red lentil dahl. 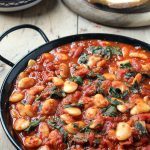 These vegan gluten-free Spanish beans are packed with flavour, but are so easy to make in less than 20 minutes! Perfect served with rice or fresh bread. Heat the oil in the multicooker set to ‘fry’ and cook the onion, stirring continuously, for 3-5 minutes until translucent but not browned. Add the garlic, paprika and bay leaves and fry for a further minute. 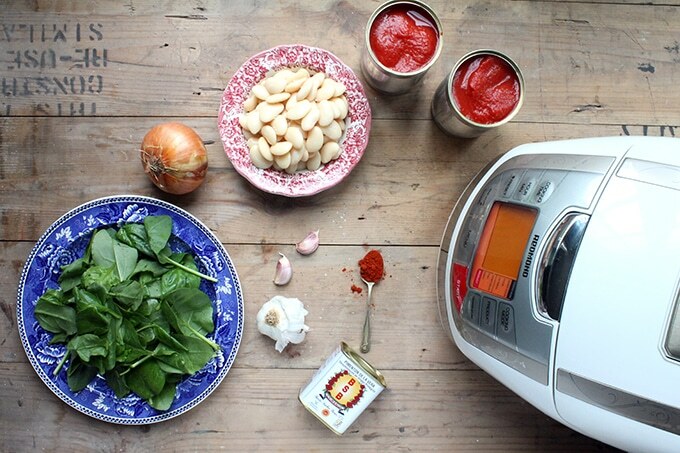 Set the multicooker to ‘multicook’ for 15 minutes and add the beans and tomatoes. Stir and break up the tomatoes a bit, then season with salt and pepper, close the lid and allow to cook. As it finishes, stir the spinach through to wilt. You could make these Spanish beans on the stove top, but I made them in my Redmond Multicooker. It’s like a fast slow cooker, but it also boils, steams, bakes, and more. It’s compact and can replace so many other kitchen gadgets. One of my favourite features is that you can add ingredients and set it to cook while you’re out. It will safely cook the food to your settings and even keep it warm automatically if you’re running late. It’s great to come home from work to the smells of dinner that has cooked while you were out! You can read my full review of the Redmond Multicooker. Disclosure: Redmond commissioned this recipe. All opinions are my own and no editorial control was given. 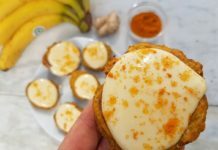 Thanks for supporting the brands that make it possible for me to be a UK food blogger, mess up my kitchen, bake vegetable cakes and write Veggie Desserts – and Healthy Meals and Lifestyle.